If you're a cook, you know that creating a delicious stock, soup, or stew often starts with basic ingredients and builds from there. The French have their mirepoix of onions, carrots and celery; the Italians have their tomato, garlic and basil; and Cajun cooking has its holy trinity of onions, peppers and celery. Each of these flavor bases makes the food tasty and delicious and unique to that region. Clay and Limestone has its own trio of flowering beauties~Golden Ragwort, Columbine and Downy Phlox ~ that make the garden a colorful and tasty treat each spring. All three are native to the Nashville Basin. The Basin is an elongated mixing bowl of land where Mother Nature has tossed cedar glade and Tennessee native plants into a unique and delicious mixture. Our tasty dish is never the same year to year, like local cooking, the proportions all depend upon the weather and what nature makes available! Let's take a look at these special plants that combine wonderfully to make this garden's flavor base for Wildflower Wednesday. Golden Ragwort or Packera aurea is a bright daisy with evergreen basil foliage. It makes a wonderful groundcover if the conditions are right~even moisture year round. Strangely enough, that may be why many people don't add it to their gardens~fear of a plant making too big a statement. I like big statement plants, after all, this is the home of rough and tumble wildflowers! I think it's absolutely beautiful. The small daisy like golden flowers on tall stems are chock full of pollen and nectar for small bees, flies and butterflies. Occasionally, aphids show up on a few plants, but, I leave them for the ladybugs. There are no cultivars of this beauty, the straight species is perfect! Columbine thrives in part to full shade, in any well-drained soil. I find it happiest in cracks and crevices, really, it grows anywhere a seed falls and the drainage is good! Plants tolerate full sun if temperatures are cool, but they grow better in my garden in partial shade. 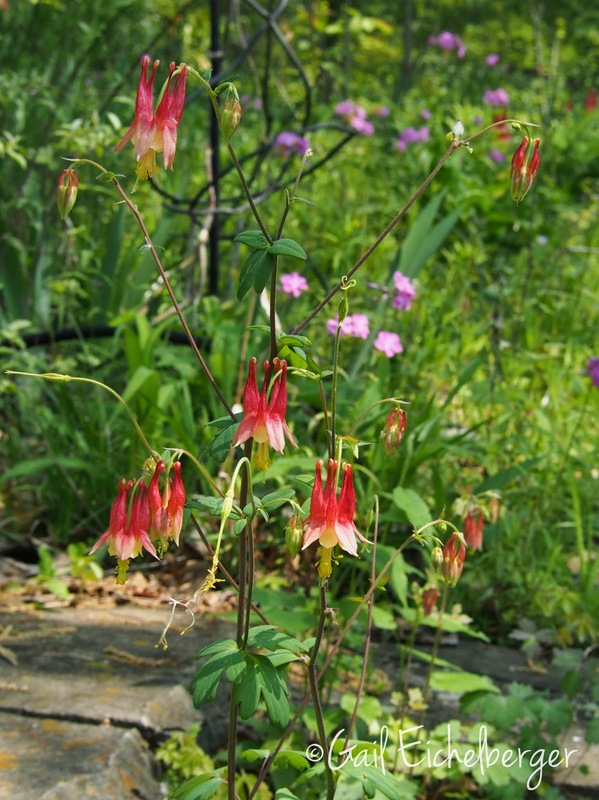 Red columbine is found in rocky woods from Nova Scotia to the Northwest Territories south to Florida and Texas. Long time readers already know about her charms...PPPP has an exceptionally long bloom time (six weeks or longer), fantastic pink flowers, grows in sun and part sun, tolerates clay soil that's wet all winter and dry all summer, has a marvelous ground covering effect, and has the sweetest fragrance that wafts all over the garden on warm days. You'll have to agree, a plant like that is practically perfect! P pilosa is a stoloniferous, semi-evergreen native wildflower found naturally growing in open woodlands, meadows, prairie remnants and limestone glades through out the central and eastern US and Canada. Although, I've never heard anyone call PPPP a thug, some gardeners may not appreciate how quickly it can spread in rich soil. Colonizing is a plus for me and unlike some colonizing plants, it's easy to lift and transplant. I am especially pleased at how well it's growing in the shallow soil over the bedrock in the Susan's Bed....That says a lot about a plant. So what do you think? Is this trio a tasty and delicious treat? 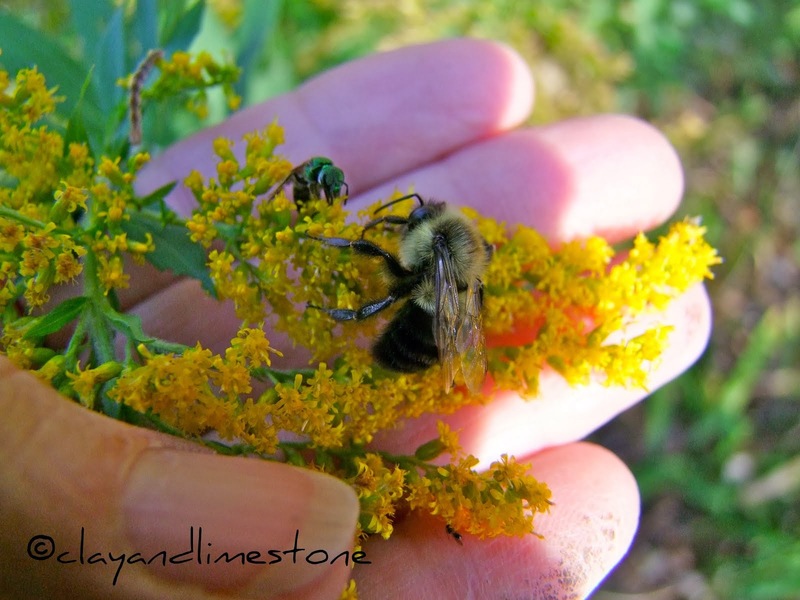 Welcome to Wildflower Wednesday! 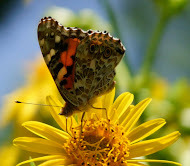 It's time to share your wildflowers no matter where you garden~the UK, tropical Florida, Europe, Australia, Africa, South America, India or the coldest reaches of Canada. It doesn't matter if we sometimes show the same plants, how they grow and thrive in your garden is what matters most. I hope you join the celebration..It's always the fourth Wednesday of the month! I like your tasty trio! How fun that they all bloom together! Dang, Wildflower Wednesday snuck up on me this month. I have a post planned, so I'll try to get it done tomorrow, but I might have to slip it in on Thursday. Love this meme! Lovely! I love the view round your birdbath. What exotic looking wild flowers. Once again thank you for hosting this wonderful meme. I really enjoy seeing the kind of flowers which grow wild in other countries and celebrating the ones that grow here. I have just added more phlox this week. I hope it does as good as yours! I had our first Columbine bloom yesterday. It has taken over under the apple tree. It looks fab. The PPPP is a little slow to come this year. Such a difficult winter we had. There is some popping up here and there. Can't wait until it blooms. I am proud to say that I have all three of these beauties growing in my garden; however, not together in such a beautiful combination as you show. They are all fabulous plants! The golden ragwort has spread beautifully and makes a lovely statement. And I can't get enough of columbine or phlox. I love the idea of them together! Thanks for hosting! PS Gail? I miss Frances of Faire Garden here. Her blog has gone quiet. Hope she's busy with happy things in RL. Good morning, Gail, I love the theme of your post! I was wondering last night, if today was a WW, and went to check, but got sidetracked. I don't know if I have any wildflowers blooming, but will go see what I can post, maybe the pretty foliage of the Virginia waterleaf. I am pleased that the couple kinds of phlox I have are up and not eaten by rabbits so far. Some even have some buds on them. Have a great day! This is such a wonderful time of year in Middle Tennessee. Beautiful! The PPPP that you sent me last year from your garden is back but isn't flowering yet. This is a great trio of wonderful wildflowers. I like that you have added so much helpful information about each of your wildflowers, I am in the UK, so I am not familiar with some of your plants and this really helps me to understand. The Aqualegia canadensis is very pretty and grown here in the borders as a cultivated plant, it must be really lovely growing wild. I've got some columbine blooming now and plenty more seedlings that self-sowed last year. I've come to really appreciate Packera. We have two large groupings of it work, where this winter only seemed to make it stronger, and I have noticed it blooming along the side of the road in more rural parts of the area. Thanks for sharing your trinity. Your early blooming wildflowers are so wonderfully bright and colorful, what a range of colors. The west coast doesn't seem to have as many bright wildflowers, most I see I really want are not native here. I do have some nice native plants blooming, I don't have to spend any time growing them so that's great. Yum! Very pretty combination. I like a big statement too. I finally found Penstemon Cobaea after a two-year hunt. Oh, your photographs are so beautiful. The detail and vibrancy of color--wow!! Thanks for hosting this little tribute to wildflowers. Hi Gail, I made a mistake, the first post is wrong (# 10 ) and the second (#11) is correct. So sorry! Looking forward to seeing my PPPP bloom in another month or so. Right now bloodroot is blooming here. Gail I love your trio and I think the ragwort just showed up last year. Now I can check it out again this year. And spring isn't spring without columbine of phlox....stunning recipe garden!! I love the PPPPP! Beautiful combination in your trinity of wildflowers. I have some Red Lanterns Columbine that I'm hoping to see bloom in the next couple of weeks. Yours are stunning. Thanks for hosting Wildflower Wednesday--great idea! Darn, I really meant to join in for WW this month, but everything is slow in coming up here. I've seen signs of the PPPP, but it's nowhere near ready to bloom. Such a beautiful "holy trinity"! I've come to love columbines; I hope some of the seed I scattered has germinated. And I will definitely join you in singing the praises of PPPP! It's definitely not a thug--I've been thrilled to see it slowly spread here, but it's been very polite about reproducing. So nice to see Chez Clay and Limestone is open for business again! I agree with Tina about the beauty of your pictures! I especially like the one with the birdbath. PPPP is still budding up here but will be in bloom soon. I totally LOVE your garden always. I hope I can see it someday. Your golden ragwort here is Packera obovata, so it was so neat to see yours! I can't grow phlox very well, but I do have various columbines. This thrills me that we perhaps our wildlife are connected across the country! I love your trio. They look so lovely together. Columbine is one of my favorite flowers too...every time I see it I'm back hiking a trail while camping with my parents. Bloom is beginning to arrive in my garden - scillas, daffs, and glory of the snow - but it will be a while before my native columbine is up and blooming. I love your sunny natives - and your climate! What a beautiful garden ! Gorgeous flowers and colors ! Thank goodness for southern friends' blogs. Am headed to GB and hope to see bluebells. It will be my first visit to the Chelsea flower show - am so excited. Really so little progress in my garden here - there are bits and pieces of natives like Podophyllum peltatum that are a quarter of their usual size, no doubt owing to the soil temperature. And now there are a plague of midges across the banks of northern Lake Ontario because of the wet cold fall. While not all that tasty, they are infinitely better than mosquitoes. A big yeah and a whoohoohoo for the PPP!